This will be their fifth appearance here. The full band has previously performed four very successful shows here in recent years. This excellent music venue is situated within The Green Hotel Golf & Leisure Resort. It is operated by Mundell Music, who has also promoted successful gigs at The Inn at Lathones and The Bein Inn. The performance area to the rear of the hotel has separate access, and in keeping with Mundell Music’s previous music ventures, gigs are very intimate. This means the audience really feels like part of the experience as the acts don’t ‘disappear’ after their performance. Instead they can often be found hanging around for a drink and a chat with fans! The capacity is limited and therefore fans are advised to book early. CLASSIC CLAPTON was formed in 1985 in Newcastle upon Tyne long before the term “tribute band” was invented. In guitar/vocalist Mike Hall, the band possesses a front man who not only looks like Eric, he sings and plays guitar like him too! In 1999, Mike won a national look-alike competition held at Madam Tussauds, London. Mike has met Slowhand twice, and even received a message of encouragement from the guitar maestro (written on a Concorde menu). In 2001 the band were honored to perform at Eric Clapton’s Fan Club Convention in London. TYNE TEES TELEVISION were so impressed that they made a programme about them, called ‘COVER THEIR TRACKS’. It was shown in 2000 and received rave reviews, leading to national recognition. In the past 32 years CLASSIC CLAPTON has become something of a rock institution. For this unplugged concert, Mike & Adam will both sing & play acoustic guitar. Their show is based around Slowhand’s multi-million selling album ”Eric Clapton / unplugged” – Eric’s best-selling album ever, winning numerous Grammies and being responsible for his resurgence as a world superstar in the 90’s. 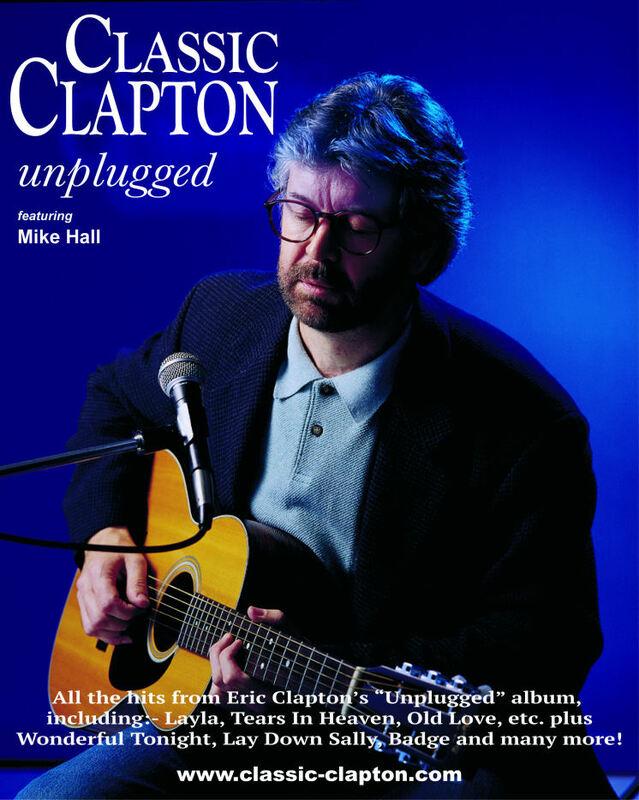 CLASSIC CLAPTON unplugged will include many of the best tracks from Eric’s unplugged album, including Tears in Heaven, Before You Accuse Me, Nobody Knows You When You’re Down And Out, Running on Faith, Alberta, Old Love and of course Layla. The concert will also feature new acoustic versions of other Clapton Classics such as Wonderful Tonight, Lay Down Sally, Promises, Change the World and While My Guitar Gently Weeps. CLASSIC CLAPTON have released three albums. Firstly “THE MUSIC OF ERIC CLAPTON” contains brilliant cover-versions of 17 Clapton Classics. Their second album is a live double CD ”CLASSIC CLAPTON Unplugged” recorded at Belfast Waterfront Hall. In 2005 they released their third album “CLASSIC CREAM” – featuring 20 songs by the sixties supergroup. All three albums will be available for purchase at The Green Hotel. Eric Clapton has been a major international star since the mid 1960’s, when he revolutionised electric guitar playing, with his virtuoso performances in John Mayall’s Bluesbreakers. He has won an incredible 19 Grammies and is the only triple inductee into The Rock & Roll Hall of Fame (as a member of The Yardbirds, Cream and as a solo artist). Eric is now in his seventies. His recent tours unfortunately have visited only a limited number of large UK arenas. It is unlikely that Eric would ever undertake an Unplugged Tour. If fans want to hear all of his hits played live & unplugged in more intimate surroundings, they should attend a CLASSIC CLAPTON Unplugged concert. The whole of Clapton’s illustrious career will be covered including Cream, John Mayall’s Bluesbreakers, Blind Faith, The Yardbirds, Derek & The Dominos and the solo years.